Tie-dyeing with soda ash is not difficult, but precautions do need to be taken because soda ash and the dye chemicals can be harmful to your skin. Soda ash balances the pH of water, helping the fabric react with the dye and absorbing the color easier. Soda ash is found in washing detergents, however, you do not want to use these products to prepare your fabric. Purchase your soda ash from specialized suppliers or your local pool supply or hardware store. 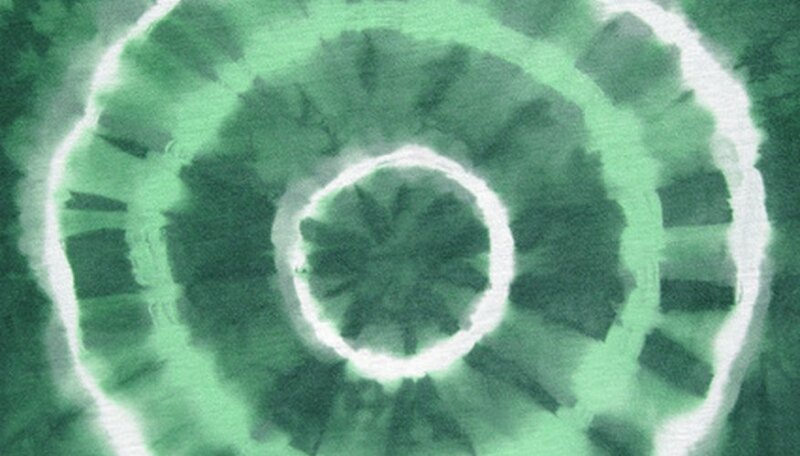 Before you begin your tie-dye project, you will need to select the best fabric; some fabrics take the color easier than others. Fabrics that consist of cotton, rayon, linen, hemp, or tencel work best for dyeing with soda ash, preferably with 100 percent content. Other fabrics such as polyester or nylon will not dye well with a soda ash recipe. When you wash your fabric, do not use fabric softener as it coats the fabric and blocks the dye from penetrating it. It is not required that you dry your fabric before beginning the dye process. Techniques for tie-dye include soaking your fabric in a vat or tub, using a bottle to squeeze the dye onto the fabric in designs. Tie your fabric with rubber bands, dental floss or twine. These will block the dye from the fabric, leaving lines. You may choose to dye the entire fabric in one color, then use the different techniques to add other colors in patterns. Soda ash is sodium carbonate and is used to prepare your fabric for taking the dye. Be careful when purchasing your soda ash; you do not want sodium bicarbonate. Thoroughly dissolve one cup of soda ash to a gallon of water. If you plan on tying your fabric, do so before soaking. You will need to wear gloves after soaking to protect your skin, as gloves can get tangled in the floss or rubber bands. Soak your fabric in the soda ash mixture for an hour, 15 minutes minimum. Do not rinse the fabric after removing from the soda ash water. Prepare your work area, ensuring that you have plenty of room to work. Select how you wish to protect your work surface; you may wish to use disposable sheets of plastic. With gloves and mask, prepare your fabric-reactive dye, following the manufacturer's directions. Remember to replace the lid to the dye as soon as you finish measuring it. You will not be able to use RIT dye with soda ash; only specialized dyes like Procion are created specifically for this type of dyeing. Lay your project flat or soak it in the vat of dye. If you lay your fabric flat, use squirt bottles designed for dyeing to squeeze the dye onto the fabric. If you tied the fabric, squeeze the dye into the sections. Temperature will affect your project developing time; 70 degrees is suggested by Paula Burch. If it is dry and too hot, placing your fabric in a plastic bag will help keep it damp. Allow up to 24 hours for the dye to react with the fabric, with a minimum of two hours. Once your project is complete, it is time to preserve your work. Rinse your fabric in cold water first, since this will prevent fading the dye, then if you wish, wash in hot water. Washing in hot water first will create a constant bleed of dye every time the fabric is washed, eventually fading your project. Fabrics like rayon and silk should be enclosed in a mesh bag or hand washed. Cold water wash is suggested; hot water is never suggested as it can fade the dyes, ruining your work.